1: Hayes FC were originally formed in 1909, going under the name of 'Botwell Mission' until 1928 when they changed their name. Their nickname of 'The Missioners' paid homage to their origins. They existed until 2007 when they merged with local rivals Yeading. 2: Originally playing at Botwell Common (the name Botwell comes from a local church) they moved to Church Road in 1920, staying there until 2011. The record attendance came in 1951 when over 15,000 turned up for an FA Amateur Cup game against Bromley. 3: Talking of the Amateur Cup, the club's best ever season came in the 1930-31 season when they lost to Wycombe Wanderers. 32,000 fans gathered at Arsenal's Highbury stadium to see them lose 1-0 to a late goal. 4: In the FA Cup Hayes were consistent qualifiers past the qualifying rounds, reaching the 1st Round an impressive 22 times. Their best progress was a 2nd Round Replay - losing to Reading in 1972 and Hull City in 1999. 5: The Club reached the FA Trophy Quarter-final on 2 occasions. The latter was in the 1997-98 season when they lost to Conference high-fliers Cheltenham Town. 7: Ugandan dictator Idi Amin was the most famous (or infamous) supporter. During his 15 year stint in the British Army, he was impressed by a fellow colleague's talking up of his favourite team. It's unclear whether he ever attended a match at Church Road, however. 9: Other famous players to play for the side include the legendary Robin Friday whose madcap antics and tragically short life can be summed up in this comprehensive Wikipedia entry. Cyrille Regis, Jason Roberts & Nikki Bull have also donned the Hayes Shirt. 10: The iconic ground was demolished in May 2011 by Barratt Homes who couldn't wait to get their hands on it. They'd already taken most of the car park in the last season and moved swiftly following the club's departure. Hayes & Yeading appeared to get a raw deal from the moves as they have been nomadic for 5 years since leaving - having to share at Woking and Maidenhead United while Yeading's former ground was redeveloped. 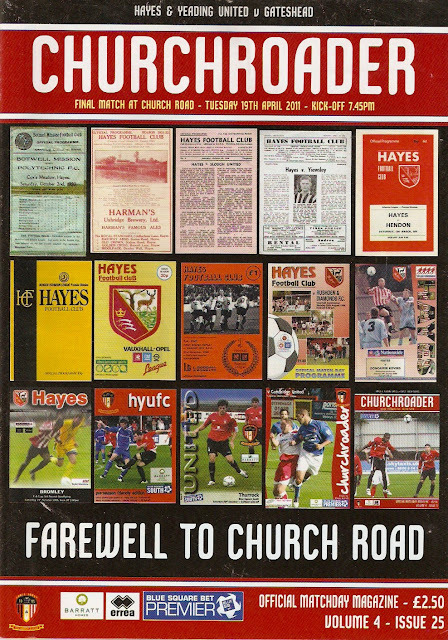 My first visit to Hayes' Church Road was in April 1994, for their Isthmian League game against Basingstoke Town. Wycombe were playing at Crewe that day, they lost and that all conspired to consign them to the play-offs in the end. 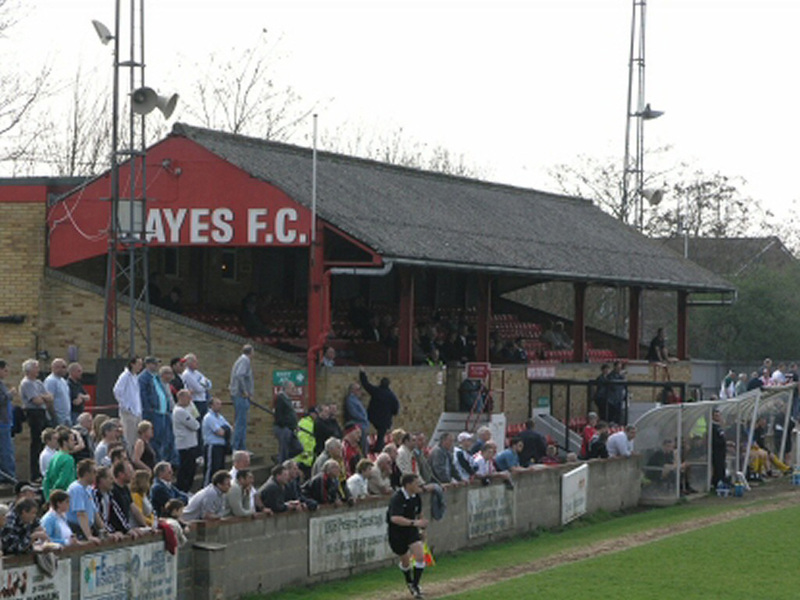 But my Dad didn't want to go far and so we went to watch a fairly local game at Hayes. I remember the day for 2 reasons, firstly the then Hayes manager Terry Brown's horrible lime green shirt – it's exactly the same as the Asda staff wear nowadays! And the second, an amazing club shop. I managed to pick up 24 Football Annuals for £1 as they were having a sale at the time. As well as that a few bargain bundles of programmes and a pennant. All in all I filled a couple of big boxes for my limited pocket money. Sadly the pennant is no more as I sold it as a job lot after I ran out of space on my bedroom wall. My second visit to Church Road came a few months after I had passed my driving test and I was eager ro revisit one of my favourite grounds. However the Friday trip turned out to be a bit of a damp squib. I travelled with my brother to watch a team of fringe first teamers, youths and trailists succumb to a 3-0 defeat in a game that I can find no details of on the internet, bar the result. One of the best games I saw at Hayes I saw came on a September night just after the turn of the century. 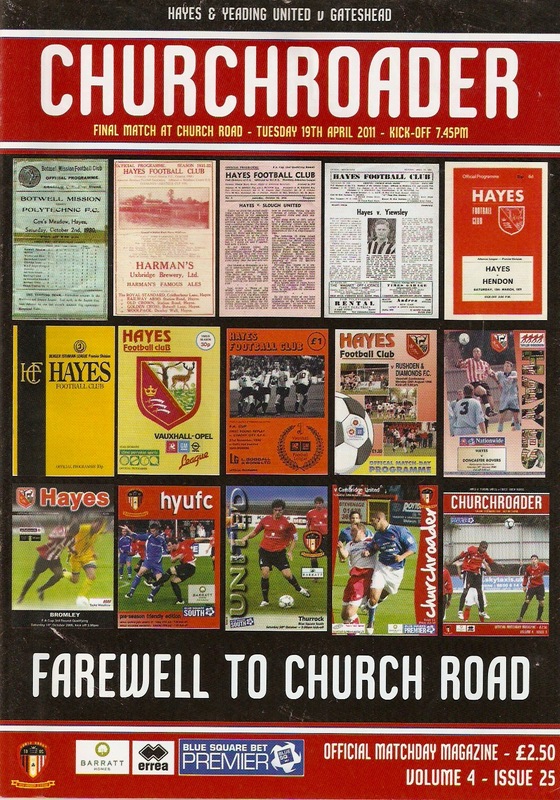 The game had form as being a goalfest with a 3-2, a 4-2, a 4-3 and most notably a 6-4 in 1998 which ended in Hayes' favour. This encounter lived up to the hype with both sides taking and surrendering the lead. For the record the Yeovil goals came from Barrington Belgrave, plus a brace from Warren Patmore. On the way back I was flashed by a speed camera on the A312, but luckily my fairly new licence remained unblemished. Probably the best game I ever saw at Church Road, this also had the biggest attendance despite being televised live on Sky, The highlights from TouTube are below, and these capure perectly a gripping cup tie with some great football being played. My only non Hayes visit to Church Road was for a Viking Greenford 'home' game. 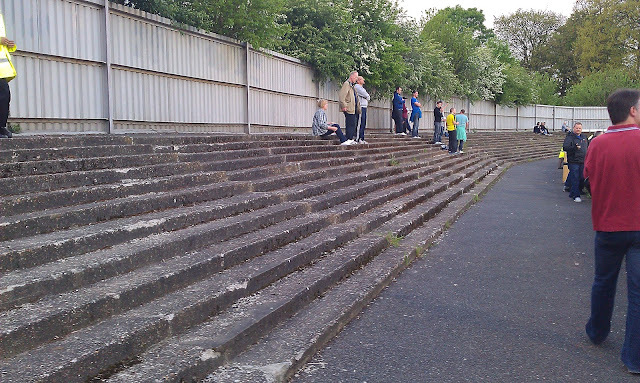 Previously known as Viking Sports and later to disolve, their Avenue Park home was deemed unfit to host such a large crowd, as were many in the Combined Counties League when AFC Wimbledon came to tow, especially in the Wombles first season. The game was played on the Sunday, so after finishing work I made my way over to Middlesex with AFC Wimbledon fan Paul. My main memory was of Wimbledon fans taking the mick out of Viking's veteran midfielder Wayne Hailey, though to be fair the balding 39 year old was his teams stand out player. Not that it was enough though - the visitors strolled to a 4-0 victory in front of a crowd of 895 to leave Greenford struggling at the foot of the table, and Wimbledon keep up the pressure at the top. These 2 visits were fairly unrmarkable. Firstly I chose a local game on New Years Day 2004 as I watched Hayes & Billericay play out a 1-1 draw, though I remember little about the game. 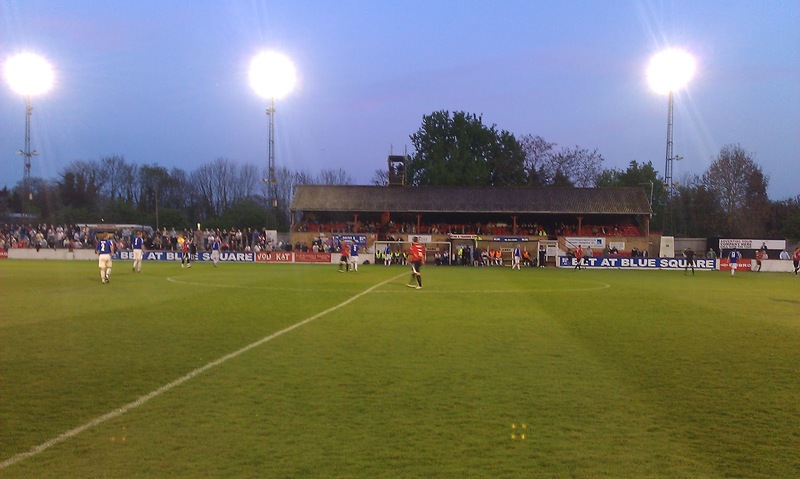 The second was a dull 0-0 draw with Hampton & Richmond, shortly after Hayes & Yeading had merged to form a new club. The game was most notable for the sending offs of Hayes' Stafforde Palmer and Hampton's Kelvin McIntosh for an off the call clash in the final minute. For my second New Years Day visit to Church Road, the match was a little more memorable. 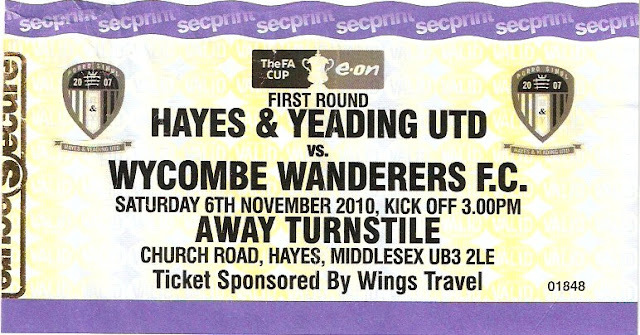 Hayes & Yeading had endured a nightmare game at Kingsmeadow the previous Boxing Day, losing 5-0 to high-flying AFC Wimbledon The return clash was cheduled for the first day of 2010 and I went, getting a lift with AFC Wimbledon fan Paul & Wycombe fan Matt. A far post header from central defender Ram Marwa was enough to win it for the hosts and gain sweet revenge for the previous week's one-sided game. The first of 2 clashes between Hayes & Yeading and Wycombe in the 2010/11 season came in a pre season clash, with Wycombe strolling to a 3-1 victory. Wycombe included a couple of trialists in their starting line up for the game. Walsall left-back Netan Sensara - one of the few Asian players to play for a football league club, has since had a varied career. He appeared for various non league clubs, as well as a spell in Scotland with Dundee. He is currently playing in Norway for Fredikstad after a previous spell in Denmark. Matt Collins, a former Swansea central defender was another - he has since played for a number of clubs in the Welsh League and was last on the books of Southern League outfit Hungerford Town. Wycombe raced into a 3-0 half time lead. On 8 minutes Scott Rendell fed Kevin Betsy who slotted past Hayes keeper Johnathan North. Rendell netted himself 4 minutes later, finishing from an excellent Marvin McCoy cross. Betsy got his second 8 minutes before the interval after more good work from McCoy & Rendell. The hosts did get a consolation on 69 minutes through Ben Wright. The striker slotted past future Hayes & Yeading keeper Steven Arnold following an error from young midfielder Sam Belcher. Later in the 2010/11 season the 2 sides met in the FA Cup 1st Round. I can't recall how I got there but I do remember going to an excellent Asian-owned chip shop where I had Samosas and Chips as well as a deep fried mars bar for pudding. In a tense first half there were chances for both sides but it was goalless at the break. Future Wycombe goalkeeping coach Lee Harrison started for Hayes but he was forced off at the break through injury to be replaced by Niki-Lee Bulmer. Former Wycombe youth defender Tom Cadmore was in inspired form to deny Wycombe on a number of occasions, but Wycombe looked to have gained the upper hand when Stuart Bevon slotted home after 69 minutes. The lead was to last just 9 minutes however with the hosts equalising through Bradley Pritchard's close range finish. They looked to have earned a deserved replay too, but Gareth Ainsworth pounced to turn in a shot that came off the bar deep into injury time to give Wycombe a fortuitous victory. As for the game, Hayes & Yeading won 3-1 with goals from Bradley Pritchard, Ben Wright and a 90th minute penalty from Lee Brown. The Gateshead goal came from Ashley Winn. It was a good match to send off Church Road and it was sad to see that only just over 500 could be bothered to turn up. Even though the home side's average attendances were in the 300's, you'd have thought there would be more than that for such an iconic ground. Little changed between my first and last visit to Church Road, but it remains one of my favourite grounds ever, with probably only Hitchin Town's Top Field beating it. One of the main reasons was the well stocked club shop which was an Alladin's Cave of football memrobelia, alll at reasonable prices. The tea bar was also a belting effort, with a great range of cold drinks and snacks, and one of the few places where I could get my favourite Irn-Bru in the ground. 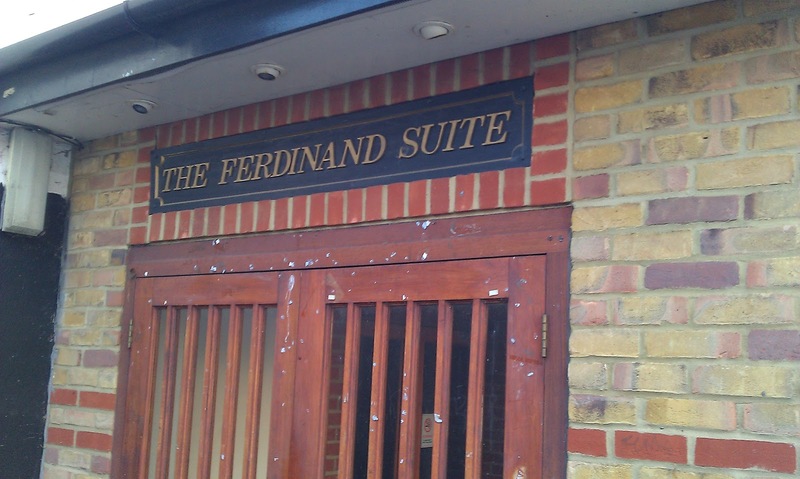 A good selection of hot food was available whilst the bar was named after former player Les Ferdinand. There was also a number of pubs and takeaways nearby. 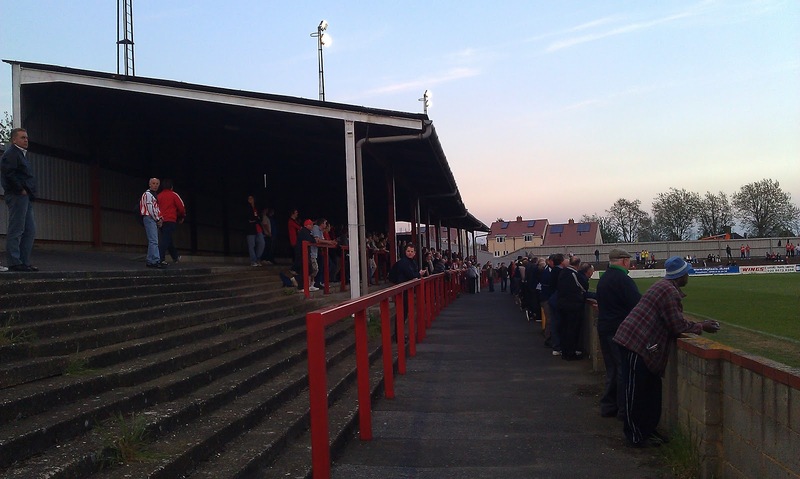 The MAIN STAND held 450 on my first visit, but following their promotion an extra 50 seats were added to comply with daft ground grading rules. These were at the front of the main stand though the bul of the seats in the upper deck offered a decent view despite the low roof. Opposite was a covered terrace which had a stated capacity of 2000 according to the the 1993 Non-League directory. This is where most of the atmosphere got going and despite the supporting pillars, it offered a good view. The rest of the ground was open terracing, bringing the capacity up to a total of around 9000. This was also slightly improved following promotion to the Conference, making it more enclosed. In particular at the car park end there was a simple mesh type fence that was replaced by a more rigid metal one. One of a dying breed nowadays, only maybe Bromley left in London now of that ilk?